Supremesoft Corporation is a privately owned company located in Markham, Ontario, which is in the northern section of the Greater Toronto Area. 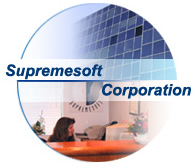 Established in 1996, Supremesoft Corporation has enjoyed long-term relationships with many of its customers. Over the years Supremesoft teams have managed and completed a number of large projects. In developing these projects we have applied our expertise in many key information technology areas such as rapid prototyping, object oriented design, centralized and distributed applications, relational database modeling and design and client-server architecture. In addition to project management services, Supremesoft and its members have designed and developed distributed application software products, enterprise-wide mission critical client-server and office automation applications. In some cases, existing legacy systems were migrated from host-based systems to client-server platforms, while in others, new systems were designed and implemented directly from user requirements. Recognizing the power of the Internet, Supremesoft, through its sister company Vastcom Network Inc., is also involved in Internet/Intranet design and implementation, Electronic Commerce/Online application development as well as Firewall/Virtual Private Network installation. Supremesoft is an IBM Business Partner with certifications in DB2, Lotus Notes and WebSphere. Vastcom Network Inc. is a Microsoft Registered Web Presence Provider for FrontPage and SharePoint. We pride ourselves on the quality and timeliness of the systems we deliver. We look forward to continued growth based on a high level of customer satisfaction. This has been attained by fostering strong cooperation and teamwork within our development teams, maintaining the highest skill level possible and by insisting on uncompromising quality in all our products.